The Surgeon’s Cottage can accommodate up to 11 guests in two self contained cottages. 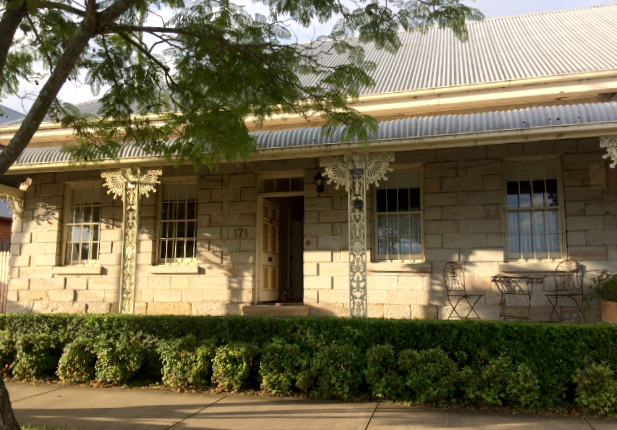 Surgeon’s Cottage – providing 2 bedroom accommodation for 4 people (for additional people see 'Rates'). Loft Cottage – providing 2 bedroom accommodation for 4 people (for additional people see 'Rates'). . Both Cottages are suitable for a couple, families, groups and perfect for bridal party accommodation, with stunning photo opportunities. This beautiful heritage home built in 1845 is situated right amongst the boutiques, galleries and cafes in the main street of Morpeth. The cottage has been recently restored, and the result is a cosy country cottage full of timeless appeal and modern conveniences. The cottage can accommodate 4 guests in two bedrooms. This quaint cottage is in the garden behind the Surgeon’s Cottage, has lots of charm with its original décor and unique loft bedroom. The village of Morpeth is a historic river port on the Hunter River, settled in the early 1800's and is today considered the Hunter Valleys premier shopping venue. Tourists are drawn to the electric blend of history, arts and crafts and dining experiences in the pubs and cafes along Swan Street, and the many speciality shops in the stone alleyways around the village, all of which are right on your doorstep.